Bots are software applications that typically run repetitive and easily-automated tasks. You can find bots posting content or interacting with users online without any human involvement. They are a valuable tool, often employed to answer questions and post updates to articles. However, there’s also a dark side to bots. Their malicious behaviors include the ability to spread fake news and influence online rating and review systems. According to the Pew Research Center’s new research, Bots in Twittersphere, bots (be they”good” or”bad”) create 66% of all tweeted links across all web content and among popular news and current event websites, respectively. Bot percentages are even higher (89%) among popular aggregation sites that compile stories from around the web. Interestingly, a small number of highly active bots are responsible for a significant share of links to known news and media sites. The Pew study analyzed 2,315 of the most popular websites, examining a random sample of 1.2 million tweets over six weeks in the summer of 2017. To identify the bots, Pew used the Botometer, a tool created at Indiana University and the University of Southern California. The Botometer estimates the likelihood that any given account is automated. Analyzing bot traffic is a prevalent research topic with several noted academic reports in the marketplace. One study from the University of Indiana and the University of Southern California, Online Human-Bot Interactions: Detection, Estimation, and Characterization, estimates up to 15% of all Twitter accounts are bots and another study from Rice University, Hunting Malicious Bots on Twitter: An Unsupervised Approach, estimates up to 23%. The Pew analysis focuses on the content of the tweets to understand the proportion of bot links, many of which refer to sites outside of Twitter. It’s not surprising that automated accounts provide links to a higher-than-average number of sites without a public contact page. Lacking a contact page, omits the opportunity for reader feedback that provides an opportunity for corrections or additional reporting. This can sometimes be an indicator of malicious bots directing users to fake content sites. Intriguingly, automated Twitter accounts share a larger volume of links, 57% to 66%, from sites that are more centrist and an ideologically mixed. 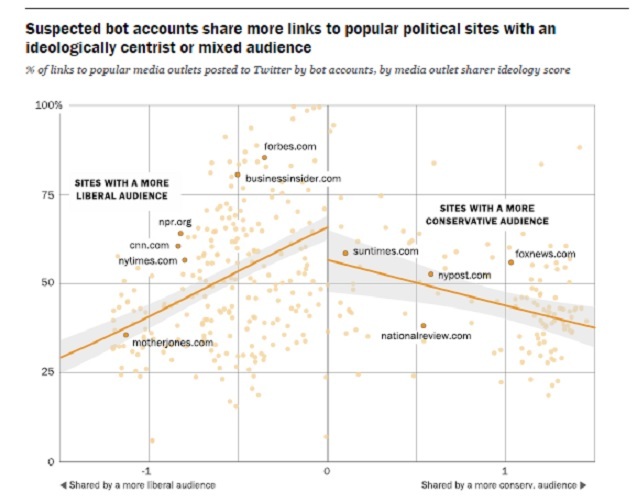 The analysis does not show that automated accounts are politically biased toward liberal or conservative in their overall link-sharing. Bot accounts share approximately 41% of links to political sites of liberal audiences and 44% to political sites of conservatives. Social media makes it easy for automated accounts to create content and interact with users with no direct human involvement. It’s seamless and usually undetectable to the user. Bot accounts play an important part in the social media ecosystem. The provide automated news updates, answering questions and offering immediate feedback and more. Nevertheless, what impact do bots have on the user experience? Additional Twitter research is needed to focus on bot engagement. Understanding to what degree bot accounts engage users and to what degree bot accounts, when combined with human-sourced accounts, impacts engage offers insight into the complete user experience on Twitter. In efforts to quantify the spread of false information online, Reuters Institute for the Study of Journalism at the University of Oxford, examines the reach of fake news in France and Italy. Both countries see fake news as a serious issue. 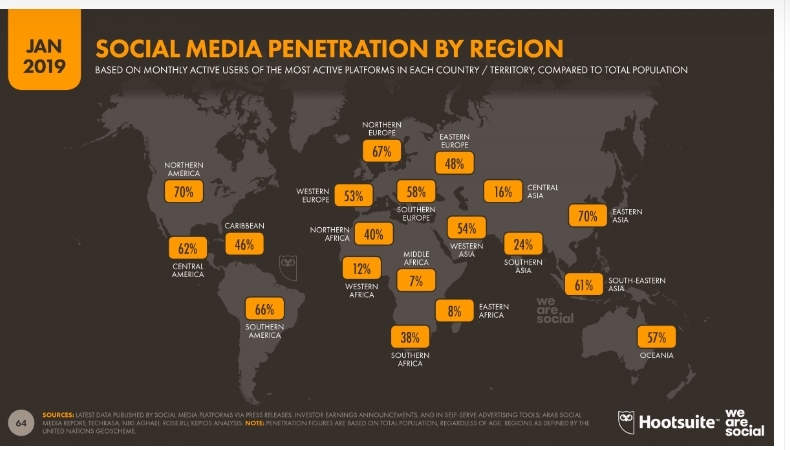 However, the report, Measuring the reach of “fake news” and online disinformation in Europe, determined the reach of fake news websites as less than 1 percent of each countries online population. The study based its analysis on 300 websites in each country that independent fact-checkers identify as publishers of false news. The research combines analytics from ComScore and CrowdTangle to measure usage of both established news and fake news sites. comScore, a web analytics company, uses a combination of panel-based and server-side measurement to provide usage data and CrowdTangle, a web tool, collects engagement data for Facebook accounts using the Facebook API. The data also shows that the total time spent with fake news websites each month is lower than the time spent with established news websites. 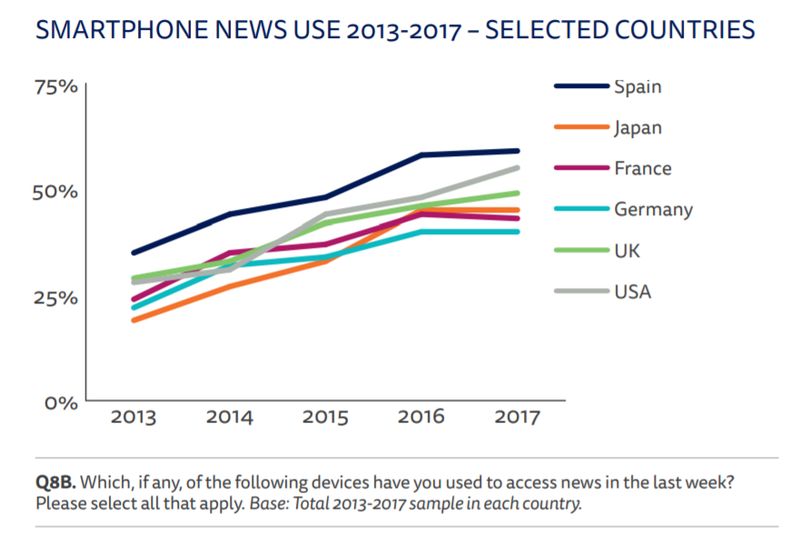 Online users spend an average of 178 million minutes per month with Le Monde (France), and 443 million minutes with La Repubblica (Italy), that’s more time than 20 fake news sites combined. While the research suggests that articles from fake news sites registered low reach and social engagement in these countries, there are still those one-off articles that reach high levels of engagement. The problem poses serious implications and what still needs to be determine is the impact of the false information on people’s attitudes and beliefs. The rapid spread of misinformation—better known these days as fake news—was named one of the top 10 dangers to society by the World Economic Forum in 2014. Powered by automation and algorithms, fake news is amplified more than ever on social media. In fact, orchestrators of fake news rely heavily on social media to create web traffic, drive engagement, and influence political views. To understand the threat and impact of fake news, researchers at the Oxford Internet Institute (OII) studied 22 million tweets that contained hashtags related to politics leading up to the 2016 US Presidential Election. 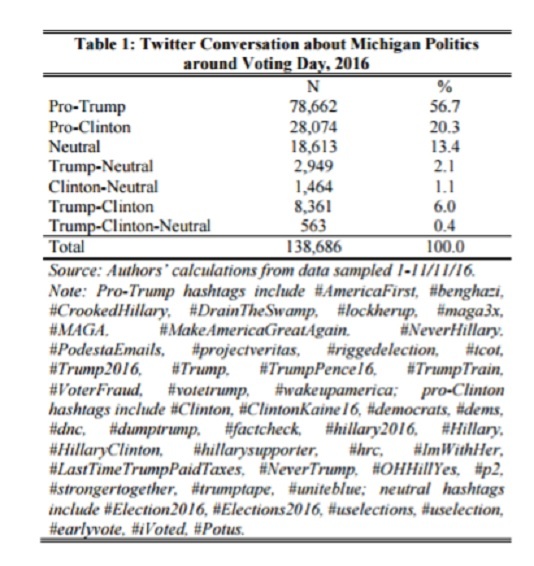 The research, “Junk News and Bots during the U.S. Election: What Were Michigan Voters Sharing Over Twitter?,” identified 138,686 users from Michigan, a battleground state evenly split between both presidential candidates, Clinton and Trump. The state of Michigan was specifically selected because the two presidential candidates were equally supported, limiting political biasness in the research. The Twitter data revealed that Trump-related traffic (57%) significantly outpaced Clinton-related traffic (20%) and neutral content (13%). Importantly, the research uncovered that professional news and fake news are close to a one-to-one ratio when it comes to political news tweets. Further, nearly a quarter of political tweets (23%) contain fake news links. 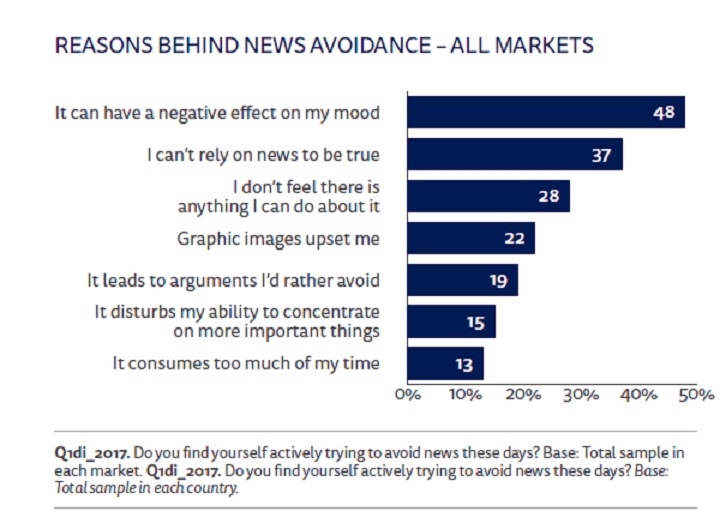 and a full 47% of the political news content can be classified as political propaganda. Needless to say, social media’s proliferation of fake news is reason for concern. Social platforms provide a fertile environment for the fast spread of fake without the necessary vetting and questioning of the information. Significantly, the Oxford Internet Institute defines “professional news” as that produced by major news brands. The information displays “the qualities of professional journalism, with fact-checking and credible standards of production. 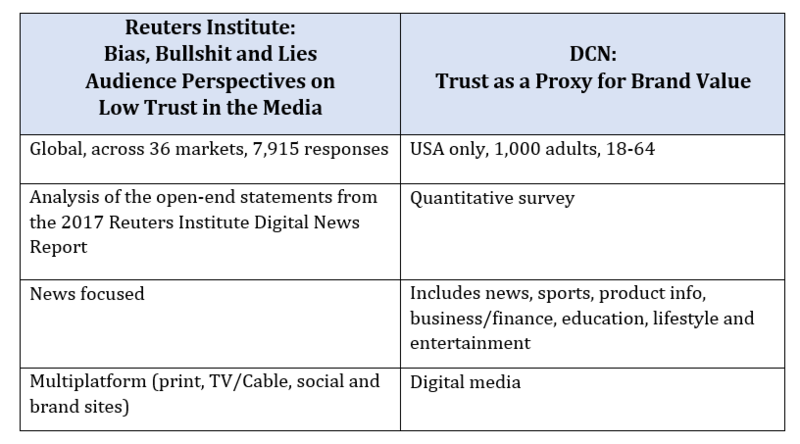 They provide clear information about real authors, editors, publishers and owners, and the content is clearly produced by an organization with a reputation for professional journalism.” And, while social platforms claim to be addressing the problem, premium publishers consider ensuring the accuracy of the information they report fundamental to their business so that they can deliver value to the reader and maintain consumer trust. Snap Inc., the parent company of the millennial-loved Snapchat app and makers of camera-equipped sunglasses, Spectacles, recently filed paperwork for an initial public offering, targeting a valuation between $20 billion and $25 billion. 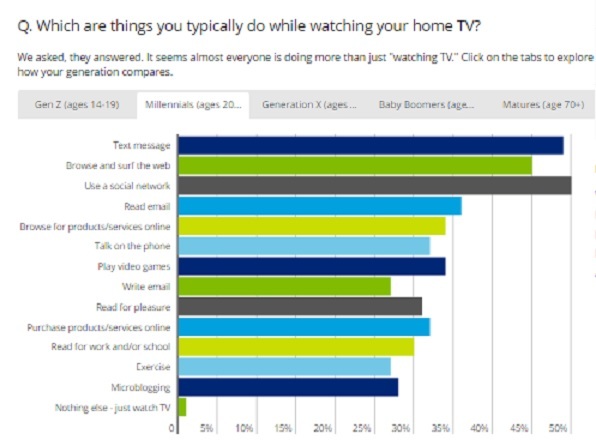 With a coveted core base — the app claims to reach 41% of all 18- to 34-year-olds in the U.S. on a given day — and a business model matching the advertising industry’s ongoing shift to mobile, the five-year-old company remains a media darling in an environment dearth of other significant offerings. But Snapchat has certainly made hay with its walled garden, Discover, showcasing content from premium publishers eager to get daily content in front of that juicy core audience. And the New York Times recently signed on to deliver its Morning Brief for Discover, citing Snapchat as the “ideal place” to deliver “smart, visual digital journalism” to younger audiences. According to new research from eMarketer, nearly half of Snapchat’s revenues last year — 43%, to be precise — came from ads on Discover. 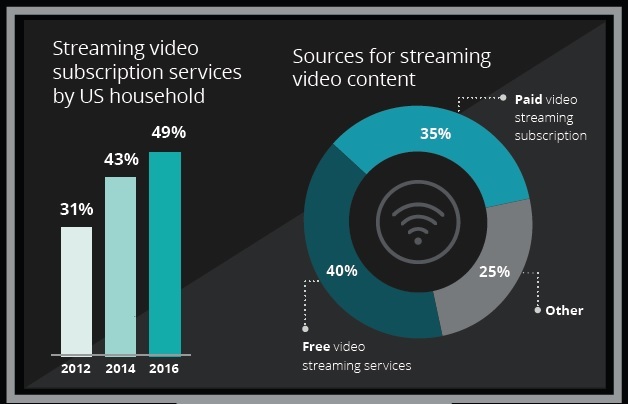 Unlike the 30-second standard ads for television commercials, or even YouTube’s 15- or 30-second pre-roll ads, the quick and easy 10-second spots on Discover are just right for an audience used to on-demand television. And advertisers must tailor their creative to the audience, in order to drive swipes and attention. Plus, eMarketer projects that Snapchat’s total revenues will more than double in 2017, from $348 million to $804 million, while the company says it is aiming for $1 billion in revenues this year. That’s great for Snap but not so hot for most publishers, who have received little more than tepid gains from their work on Snapchat, according to research from Digital Content Next. DCN found that their members surveyed reaped the least revenues from Snapchat in the first half of 2016 — $192,819 per publisher, compared to $773,567 earned on YouTube, $560,144 from Facebook and $482,788 on Twitter. DCN publishers also cited Snapchat as the most difficult company to work with. While Snapchat has alluded to future offerings of better metrics for advertisers, and announced a pay-up-front licensing model that may help publishers monetize on Discover more effectively — a model akin to what TV networks use when purchasing programming — that’s not exactly a foolproof profit plan, at least not yet. While Snapchat has managed to avoid the onslaught of fake news that’s polluted other platforms, publishers would be right to continue to be wary of giving complete control to the platform — even a hot one like Snapchat with a lock (for now) on millennials. In its prospectus, Snapchat cited “increased competition” as one of the key reasons user growth slowed considerably at the end of last year, a trend that prompted comparisons to Twitter — another company with a hot IPO that’s failed to attract new users and growth. 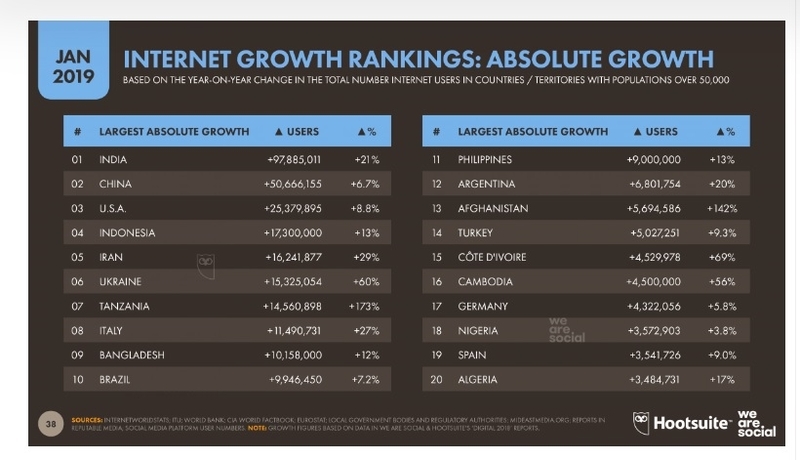 And unlike Facebook — which has grown to be the most powerful network in countries like India, where mobile connectivity is the de-facto way users access the Internet — Snapchat’s reliance on strong mobile infrastructure and cheap bandwidth costs means that its international growth is limited. It also faces competition from regional apps like Asia’s Snow. 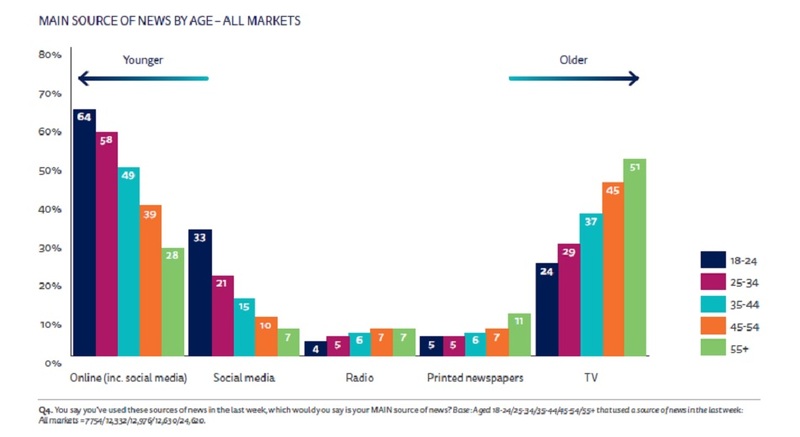 Then there’s the concern that Snapchat will fail to reach users over the age of 30, whereas Facebook has proved to be friendly for multiple generations. Better ad targeting and deeper engagement, therefore, is crucial for Snapchat. 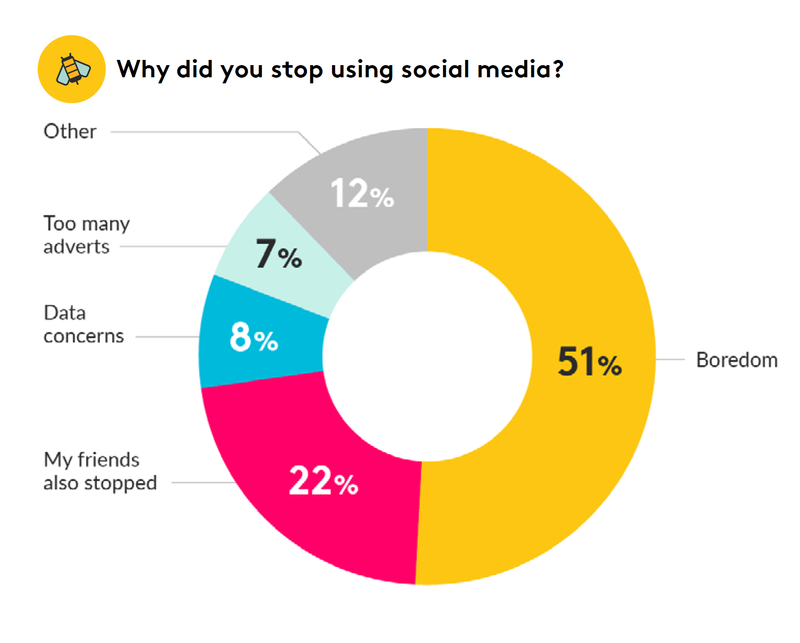 But it’s running neck-and-neck with Instagram when it comes to being an important network for teens, according to a fall 2016 survey by Piper Jaffray, with 80% of teens using Snapchat to 79% opting for Instagram. Not only that, but one in three users on both Instagram and Snapchat said they hardly noticed the ads on their platform of choice, according to eMarketer. Snap certainly has some tall orders to fill if it wants to match its valuation hype, as the buzz builds around its IPO. 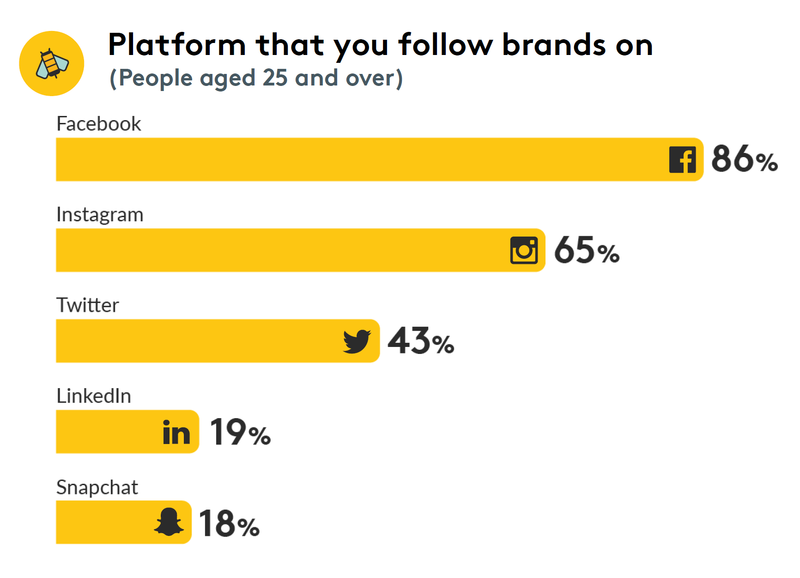 Publishers, especially magazine and digital native outlets, will continue to shower attention on Snapchat and get a payoff, but for the platform to really reach beyond its core millennials, that will take more time and investment. Many people consider Twitter to be on death’s door, almost flatlining and barely breathing. But, in the words of one Monty Python character: “I’m not dead!” Well, at least not yet. Twitter had its shares of missteps in 2016, including an exodus of executives, including its CTO and COO, and a failure to sell itself in a highly-publicized bake sale. One of the reasons that sale fell through was the problem Twitter has with trolls and abuse, which has driven off many high-profile users. And its CEO Jack Dorsey is only part-time on the job, as he’s also CEO of Square. Twitter CEO Jack Dorsey certainly showed his interest in taking public commentary seriously when he issued a public call for feedback at the cusp of 2017, asking what the microblogging service ought to be doing better. His request drew hundreds of responses circulating around four themes: curbing online abuse; allowing an edit function; providing users better management of topics and interests; and offering easier ways to track conversations. His tweets on the four requests — brief, of course, given he was limited to 140 characters — show where Twitter may put more emphasis this year. He said that following topics was the strongest request and that being more topic- and interest-focused “opens up a lot.” He also noted that conversations, while a huge part of what makes Twitter magical, are simply very difficult to follow, and promised to make that easier. So it looks like we can bank on anticipating more ease in those departments. The others are a bit thornier. It’s one thing to offer a quick fix to edit errors, for instance. But if the President of the United States uses Twitter in such a way that his account becomes the most powerful publication in the world — and it’s a guarantee that his tweets will be included in news stories — Twitter is no doubt part of the public record. It’ll have to do more development to ensure accountability if it chooses to steer toward an edit function. When it comes to abuse, meanwhile, Dorsey acknowledged that a ton of work is necessary ahead and that the “biggest ask” was for greater transparency around its actions. And then, as if on cue, Twitter swiftly shut down the account of pharmaceutical executive and Trump supporter Martin Shkreli after he targeted freelance reporter Lauren Duca — who penned “Donald Trump is Gaslighting America” on Teen Vogue. You could see that Twitter was at least trying, even though it missed the opportunity to showcase full transparency by only giving a one-sentence response to justify shutting down Shkreli’s account. That aside, the fact that this occurred on Twitter — followed by chatter around it on Twitter — only to be followed by news about it generated again, on Twitter — shows the company excels at a certain kind of rabid engagement among its regular users. In fact, it could have been a Twitter Moment, something that marketers and publishers are also experimenting with on the platform. Moments, with its curated tweets, are an ideal product for casual users who don’t want to be on the platform all day but want to know the Twitter gossip around a particular event or story. From a brand or company perspective, they’re also inexpensive to produce and take advantage of the real-time marketing that Twitter also offers — hence why clients as diverse as Lime-A-Rita, YouTube and Newsweek are all jumping into the fray. It would come as no surprise if more news clients and marketers followed suit in 2017, or if Twitter did more to enhance the feature — after all, Moments is already a solution to help people follow a topic or interest. Indeed, while Twitter may never be able to scale the way Facebook has, it has been leaps and bounds ahead of its rival when it comes to hiring editors, working with news publishers and generally positing itself as a media company. Unlike Facebook, whose recent hire of Campbell Brown to lead news partnerships seems more like a hire of a marketing rep rather than a public editor or editor in chief, Twitter is looking to hire editors and an associate producer. And let’s face it: News breaks all the time on Twitter, whether by eyewitnesses at the scene, or journalists giving inside dirt, or celebs and sports stars posting what they shouldn’t. Twitter has also been testing breaking news push notifications along the lines of the Associated Press and New York Times, and has moved from the “social networking” to the “news” category on Apple’s App Store. Not only that, but Twitter’s push into live video, including its deal to air NFL games live on the platform, is a much more elegant maneuver than Facebook’s own insistence on Facebook Live (which, with its conspicuous sponsored posts on Facebook and enormous banners on buildings, seems much more desperate). Twitter may have trouble growing its user numbers and stock price, but its relevance keeps rising. Let’s see what 2017 brings. And remember, when you hit rock bottom, there’s only one way to go: up!